Peace Corps Online: Professor Gale Summerfield assigned students to conduct a public policy scenario applied to a developing country. Having worked in Guatemala as a Peace Corps Volunteer from 1989 to 1992, I decided to use Peter Laurie as my "fictitious" personae. Professor Gale Summerfield assigned students to conduct a public policy scenario applied to a developing country. Having worked in Guatemala as a Peace Corps Volunteer from 1989 to 1992, I decided to use Peter Laurie as my "fictitious" personae. Peace Corps Online: Directory: Guatemala: Peace Corps Guatemala: Peace Corps in Guatemala: Professor Gale Summerfield assigned students to conduct a public policy scenario applied to a developing country. Having worked in Guatemala as a Peace Corps Volunteer from 1989 to 1992, I decided to use Peter Laurie as my "fictitious" personae. This research project was conducted by Matthew Barclay for a course entitled Development Economics at the Monterey Institute of International Studies, Spring Quarter 1997. Professor Gale Summerfield assigned students to conduct a public policy scenario applied to a developing country. Having worked in Guatemala as a Peace Corps Volunteer from 1989 to 1992, I decided to use Peter Laurie as my "fictitious" personae, although Mr. Laurie actually was Director of Peace Corps Guatemala during the final days of my service there. Actually, prior to his appointment as PC Director, Mr. Laurie worked as a contractor for the United States Agency for International Development near where I worked in the Department of Totonicipan. This paper is affectionately dedicated to him and all A.I.D. personnel who went out in the trenches to work with Guatemalans as opposed to those who sat behind desks and felt a benign sense of accomplishment. My name is Peter Laurie, I am twenty year veteran working for the United States Agency for International Development. I have spent the majority of my years working in Sub-Saharan Africa, so it was surprising to me to be summoned to work in Central America and more specifically to Guatemala, a country I know very little about. The program I have been assigned to is entitled: "Indigenous Community Extension." This program has been designed specifically to improve participation levels of the indigenous Mayan Indian population in the village of San Carlos Sija, which is in the western highlands of the country, located at an elevation of around 2,500 meters above sea-level. The program will involve an extension of five native Mayan villages: San Vicente Buenabaj, Chautuj, Recuerdo a Barrios, Esquipulas Seque, and Las Cruces. Based in Central Sija, I will visit these villages, one a week, and work on a variety of programs. One project includes an extensive irrigation system which will be set up for growing vegetables for exportation. A buyer has already been located in the United States who is very anxious to import organically grown cabbage during the off-season. Coupled with this main project will be inoculation programs for children at several Centro de Saludes (community healthy centers) and demonstration gardening plots. Additional work with the Centro de Salud includes setting up demonstrations which are designed to educate families on the importance of such areas as basic sanitation and nutrition. Included with this will be a latrine program which will target over 300 pit latrines per aldea. Additionally, AID has provided funding for over 200 tuition waivers for Mayan children of these villages to attend the local Instituto Basico, a vocational middle school..
My program contract is for two years and in order to satisfy these objectives, I will require excellent time management skills, sensitivity to community needs as well as a thorough understanding of the culture in which I am to work. Before I depart for Guatemala, I will need to familiarize myself as much as possible with an economic background report that was prepared by my predecessor, Mr. Matthew Barclay. Mr. Barclay was an Agricultural Extensionist who has worked in Guatemala for two years and has a distinct interest in Guatemala and her people. What follows his general background in four specific areas is a series of policy recommendations. After reading his report, I will determine whether I will make any changes in my approach in the "Postscript" section..
Guatemala is the largest Central American country for both its population and size (10 million) and for its economy (1997 GDP was estimated at $14.3 billion dollars). Despite its recent rates of economic growth however, Guatemala has one of the worst income distribution patterns in the Western Hemisphere. The poorest 20 percent of the country secures only 2.1 percent of the country's income while the highest 10 percent controls almost 50 percent (HDI Index,1996, p.170). Over 71 percent of Guatemala's population lives in poverty (USAID, 1995, p.3). 86 percent of Guatemala's extremely poor are comprised of the Mayan indigenous population who are isolated socially, economically, and politically, largely due to discriminatory factors (USAID, Ibid).. Poverty statistics are dramatic in Guatemala, but often they fail to truly convey the human face of deprivation. As a Peace Corps Volunteer who worked in Guatemala from 1994 to 1996, I bore witness to the everyday life that the vast majority of Guatemalan people lived: families lacking basic services such as electricity or running water, extreme vitamin deficiencies among both the child and adult populations, and the lack of basic sanitation. What was striking about all of this was that the Mayan indigenous population (which comprises over 50 percent of the total population) with whom I worked tended to bear the brunt of most of the suffering.. This paper will examine Guatemala's extremely poor record of income distribution primarily among its indigenous Mayan population. It seeks to cover the root causes of this condition . Perhaps the most significant proposal for this study is the belief that the greater inclusion and participation of the indigenous population of Guatemala will significantly benefit the nation's productive and hence it's financial capacity. 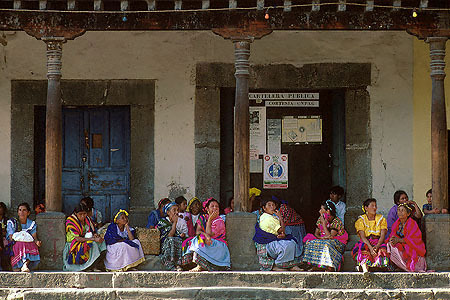 It stands to reason that if over half Guatemala's population is comprised of indigenous peoples and 86 percent of them live in extreme poverty, that Guatemala as a whole suffers as a nation whose productive capacity is extremely under-fulfilled..
One of the key areas important for examination of economic disparity is a population's access to and attainment of quality education. As a nation, Guatemala spends about 1.6 percent of its total government expenditure on education. This is by far the poorest in Latin America (USAID, 1995, p.3). As a highly centralized and inefficient system, educational enrollment deficits range from between 30 to 40 percent (Barry, 1992, p.175). Perhaps more significant is the fact that only 48 percent of the population in Guatemala is literate. (Barry, Ibid) The literacy rate among the indigenous is by far, worse. USAID has estimated that up to 90 percent of Guatemala's indigenous female population is illiterate, with their male counterparts fairing only 10 percent better (USAID, 1995, p.6)..
Sources: Analisis de situacion: Guatemala UNICEF, May 1995; Ministry of Education (1994); National Stastistics Institute (1994). Human Development Index, 1996. Low enrollments for the indigenous are easily explained. Mayan children are often encouraged to stay home and help with the highly labor-intensive seasonal planting. During the off-season, young males within the family leave their homes for the coast in order to participate in the coffee harvest. In many cases, young Mayan girls avoid going to school in order to help their families maintain the soil throughout the off-season. Certainly, the high levels of illiteracy due to poor quality of education and poor attendance has an economic impact on the country as a whole..
Woefully uneven land distribution in Guatemala stands as one of the critical issues contributing to this nation's high rate of poverty and economic disparity. Prior to 1524, Guatemala was primarily an agricultural society in which land was cultivated both individually and communally to produce food and other necessities. From the colonial experience (1524-1821) economic, social and political priorities came to be determined by the needs and interests of the dominant classes of Spain (Jonas, 1991,p.14). This system called "latifundia" set up an extremely uneven pattern of land distribution which has characterized Guatemala up until present day.. The only serious attempt at land reform in Guatemala took place in 1952 under the popularly elected government of Jacobo Arbenz, a left-leaning reformer who was quickly at odds with United States business interests, namely, the United Fruit Company. Accused of promoting a Communist State in Latin America, Arbenz was quickly overthrown by a United States' backed coup in 1954 (Schlesinger and Kinzer, 1982, p.93)..
Sources: H. Jeffrey Leonard, Natural Resources and Economic in Central America: A Regional Environmental Profile (Washington DC: International Institute for Environmental Development, 1990). The legacy of the 1954 coup for the present is that fewer than 2 percent of landowners own 65 percent of the total farmland of Guatemala. Compounding this situation is fact that the majority of Guatemalans who do own land, do not have the adequate resources to care for what they own. Insufficient land maintenance practices mean very poor yearly harvests from soil which is often exhausted from overuse.. Within the past ten years, the number of people living in extreme poverty has grown in large part, due to the rapid deterioration of the natural resource base from which 80 percent of the population derive their income (USAID, 1995, p.3) The need for greater sustainable practices is now stronger than ever..
No study of income distribution should exclude the issue of women in development. In Guatemala, conditions for women, especially the indigenous are extremely poor. The prevalence of "machismo" is Guatemalan society is rife between both the indigenous and ladino cultures. Women, by and large are discouraged from owning property, or securing an independent financial status. The prevalence of domestic violence against women in Guatemala is especially distressing. While there is little statistical evidence recorded, what is available is shocking. In 1991, a doctor concerned about the problem discovered that three-quarters of women treated for injuries at his hospital had been beaten by their spouses (Barry, 1992, p.163). The laws in Guatemala additionally are skewed in favor of the male which makes prosecution for such offenses extremely difficult (Barry, Ibid)..
Sources: Instituto Nacional de Estadistica (1987); Organizacion de la Mujer (1991);Politica nacional para el desarrollo y promocion de la mujer en Guatemala. Life for the indigenous female is particularly difficult. Owing to high rates of illiteracy, poor access to health facilities, language barriers, and discrimination, the indigena of Guatemala struggles against insurmountable obstacles. While infant mortality rates are the highest in Latin America, the maternal death rate is the fifth leading cause of death among females age 15 to 44. A typical day in the "campo" consists of collecting firewood in the mountain where bundles weighing in excess of 100 pounds are hauled on the back. Cooking consists of "tortiaring" or making tortillas, which is an extremely labor-intensive practice often taking over two hours. Women often additionally spend long hours in the corn fields planting as well as maintaining the critical harvest. Clothing is washed down by the riverbank and carefully dried in the sun. Along with this comes all of the attendant child raising responsibilities.. When questioning the level of women's capability and agency in Guatemala, it can only be concluded that severe limitations stand in the way, particularly for indigenous women. Besides the aforementioned dilemma of spousal abuse, indigenous women are severely hindered by discrimination and inferiority that are passed down from generation to generation. Besides notable exceptions such as Nobel laureate Rigoberta Menchu, indigenous women, by and large, suffer from a general lack of empowerment. This is primarily the result of their large-scale exclusion from education and the machismo which persists sadly among their male counterparts. Independent economic activity for women is by and large, looked down upon. In the countryside women frequently must ask permission of their husbands in order to become involved in small-scale group activities that generate income. Much of the work that is performed by women is unfortunately given a secondary importance, ironic in that many of these activities provide life-sustaining benefit for their families. For example, money generated from sewing projects is invested more often than not, in nutritional intake for their children. A woman's involvement in vegetable gardening projects (which generally speaking, was avoided by and large by men during my Peace Corps service as non-essential) likewise provide well-needed vitamin and mineral supplementation for all family members.. Rural to urban disparities in Guatemala are quite severe. A visitor living in Guatemala is quickly struck by the stark contrast between countryside and Capital City. Within certain zones of the Capital, all of the luxuries attendant to a modern city are evident. Streets are freshly paved; lights are brightly lit. Modern restaurants serve fine European food while Guatemala's elite speed around in luxury imported vehicles.. In the countryside where over six out of ten million people live, only 43 percent of the population has access to safe drinking water. Infrastructure in the countryside is extremely weak characterized by unpaved roads and lack of telecommunication between villages (2.1 telephones per 100 people). In some areas of the Western Highlands there is no electricity nor are there sanitation facilities (ie. family latrines). Lack of clear-cut governmental priorities towards the rural sector becomes extremely obvious as a visitor feels he or she is transformed back into feudal times, with oxen crudely plowing the fields with their harnesses tied inefficiently around their horns, while laborers toil with their burdens from sunup to sundown.. Rural health facilities are mostly ill-equipped and staffed by itinerant physicians who often maintain undependable schedules. Medicines are in scarce supply, while surgical procedures are sometimes performed without benefit of anesthesia (a fact I witnessed on more than one occasion). Statistics from the 1996 Human Development Index report that only 25 percent of rural residents have access to health care (HDI Index, 1996, p.166). Rural to urban sanitation stands at 52 percent to 72 percent receptively (Ibid). Percentages of GDP expensed on the health sector amounts to less than 2 percent. This lack of clear-cut prioritization means that basic health necessities such as prenatal infant care is non-existent while very serious nutritional deficiencies such as Vitamin A diseases cause needless blindness..
Sources: Situacion alimentaria nutricional de Guatemala: INCAP and OPS, March 1991); Human Development (UN Program for Development, March 1991). The long-term effects of such institutional neglect will certainly be felt for generations to come. Children, the majority of them indigenous growing up without basic nutritional foundation are irreparably harmed. This spells bad news for any country hoping to transform itself through an educated work force..
For Guatemala truly to improve upon its current economic situation some fairly aggressive policies will need to be enacted. One positive sign for the country has been the recent signing of a peace accord last year in Mexico City which has ended Guatemala's 35 year civil war. The core issues of this conflict have revolved largely around the aforementioned issues: unequal land distribution, unequal access to education, desperate health concerns, as well as discrimination against the largely indigenous majority in the country. Foreign assistance has been slow in coming due to the very violent nature of the conflict which had caused up to one million casualties during the conflict's thirty-five year period. Guatemala, having perhaps the worst record of human rights abuses in Latin America during the 1980's, was crossed off the list for any substantive economic aid (while military aid was very generous) coming from the United States.. The monitoring of the current peace process will indeed be costly. The supervision of four agreements on human rights, resettlement issues, the establishment of a historical clarification commission, and the rights of the indigenous will require funding that will exceed Guatemala's current domestic reserves and revenue-generating capacity (USAID, 1997, p1). The generosity of foreign donor nations will be crucial for Guatemala as it heads into a transition from war to peace.. Poverty alleviation through specific government action must be enacted as quickly as possible. The encouragement of sustainable agricultural practices is a key component which should lead to substantial improvement. Guatemala, being a land blessed with rich soils and micro-climates that are highly suitable for a wide variety of non-traditional agricultural crops, should work extensively on crop diversification programs which will benefit both small farmer and nation as a whole. The question of land reform is a key issue that remains in the minds of many Guatemalans. The simple re-distribution of land would not solve the nation's agricultural production problems nor would it necessarily lead to improved economic livelihood for the nation's poor. Resource-poor farmers have enough difficulty maintaining their current land holdings as they attempt to buy fertilizers and pesticides or try selling portions of their corn and bean harvests to local cooperatives. What is necessary however is the further investment in such organizations as DIGESA and DIGEBOS (General Direction of Agricultural Services and Forestry, respectively). These organizations have been established by the Guatemalan government in order to encourage the diversification of Guatemala's many natural resources. Unfortunately, these programs are extremely under-funded and lack a professionally-educated infrastructure. Currently salaries are so marginal for DIGESA employees that many lack the motivation to show up to work day to day. The reputation of this organization among rural farmers is poor. The majority of those employed by DIGESA come from the very villages where they work, most of them lacking primary school education. The conservative nature of the Guatemalan farmer will not allow him to take many chances with his crops while listening to "unconventional" advice provided from his poorly paid and educated DIGESA neighbor.. The increased investment into education is certainly key for Guatemala's future. More money simply will need to be invested especially in the rural countryside in order for literacy levels to improve. Guatemala's very high rates of illiteracy will continue to have negative consequences on any hopes for transforming the country into an export-led economy. The educational empowerment of rural farmers will certainly pay off dividends down the line. Teacher salaries must improve while strict enforcement of compulsory education through secondary level is extremely important.. Improved rural health programs additionally must be strengthened. The dismal state of nutritional imbalances among Guatemala's poorest must assume top priority. Currently organizations such as PLAN International and Agency for International Development are working feverishly in order to provide vaccination and nutrition programs in order to stave off disease and malnutrition. The dependence on foreign governments and NGO's to meet Guatemala's most basic needs shows a lack of prioritization that belies this nation's recent impressive rates of GDP growth. Guatemala certainly should invest more into its rural health facilities while staffing their Centro de Saludes with physicians from the local community. Increased support for Women in Development programs are also crucially important. Small Business Enterprise projects are currently getting underway in Guatemala, so the encouragement and preference towards the funding of these programs via low interest loans will be an important start. Further education of the involvement of Women in Development should take place at the local level with rural educators from the community. The stigma of women receiving an independent income should be removed especially in the indigenous communities. The benefits of such programs will be many. Perhaps most importantly, basic income derived from such programs will lead to increased nutritional levels for children, which are such a crucial necessity during the early cognitive stages of development. On a small-scale, headway should also be made in the encouragement in the export of handicrafts that the indigenous women of Guatemala are so adept at creating. The intricate patterns of these "guipils" certainly would attract important markets abroad while allowing women to stay home during their early child-rearing years. The government of Guatemala should attempt to aid in the formation of cooperatives which might locate markets for this most traditional of artistic endeavors..